Have you ever tried noting down the food that you take each day? Majority of us would be shocked to note that not a single day would have passed, without including junk food of any kind in our diet. To cleanse away all toxins that we accumulate on daily basis, it is essential to have foods that are packed with nutrients, vitamins and minerals that have the capacity to give you all that you need, and do not give you anything that you don’t. Such foods can be completely used up by the body, as they help to get down to a session of cellular spring-cleaning. It is truly said that an apple a day keeps the doctor away. Firstly, apples help reduce cholesterol, as studies have proven that they lower harmful levels. Women who eat apples lose weight more easily than those who do not. This is due to the presence of a compound in the fruit that suppresses appetite. Apples strengthen bones through presence of a flavonoid ‘Phlorizin’ that prevents osteoporosis. Apples are also thought to ward off Alzheimer’s. Apples, when cleansing your body, cleanse liver, kidneys, and boosts good health in general. Due to the presence of considerable levels of pectin, the apples keep digestive tract healthy. Broccoli is a great source of calcium for healthy bones and teeth. Due to the presence of two compounds – lutein and zeaxanthin, found naturally in the vegetable, it helps keep eyes healthy and prevent age-related deterioration. The vitamin C content in Broccoli is much higher than in oranges, and the vitamin A and K helps for blood clotting. Broccoli has a strong positive impact on body detoxification. The presence of nutrients glucoraphanin, glucobrassicin and gluconasturtiian, helps neutralize and eliminate unwanted contaminants. Toxins that pose a risk to our cells are detoxified through a two step process. Blueberries contain plenty of antioxidants. They improve eye health, and the compounds called Anthocyanosides present in the berries slow down age-related vision loss. Being high in fibre, they encourage healthy bowel. Blueberries offer antioxidants to neutralize cell-damaging free radicals and contain ‘quercetin’, a pigment that increases the number of enzymes in the liver. The vitamin B6 helps recharge detoxifying enzymes throughout the body, thereby helping with detoxification. Papaya is a great source of powerful antioxidants and vitamins – A, C and E and are full of fibre, that help moderate cholesterol levels. The presence of enzymes such as papain and chymopapain, makes it anti-inflammatory. The presence of lycopene in papaya helps reduce a man’s risk for developing prostate cancer. 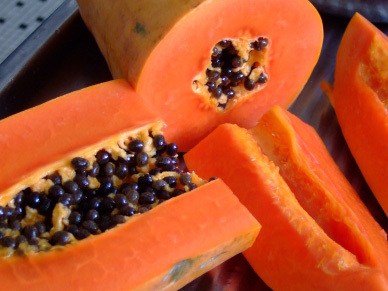 The seeds present in papaya are good for removing parasites living in your body. With its natural laxative abilities, Papaya is a natural detoxifier. Prunes are excellent colon cleansers. They have recently been confirmed as being beneficial for digestive system. Try to include at least three prunes a day in your must-have list. They are rich in essential nutrients including potassium, copper and iron, all of which are vital for healthy muscles, hair and nails. Being high in fibre, prunes are an excellent choice for gentle colon cleansing or they are an all-natural laxative, helping alleviate constipation. The fibre in prunes feeds the good bacteria in one’s intestines.